Sara: Pasta salads are great as a side dish or even entire meal. You can be as imaginative as you want, as healthy or as naughty depending on your mode! 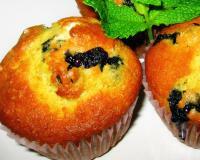 They are also easy to transport which makes them ideal as picnic, potluck or office lunch options. This recipe is as tasty as it is easy, enjoy. Pasta: 250 g (You can use any type of small or medium sized pasta like penne or shell. Whole wheat and flavoured pastas work well too. 1. Preheat oven to 450 degrees F . Line a cookie sheet with foil. 2. Cut the bell peppers, yam and the onion into 1/2 inch pieces. 3. In a medium bowl toss the vegetables with 2 the olive oil, salt, and pepper. Arrange on the prepared cookie sheet. 4. 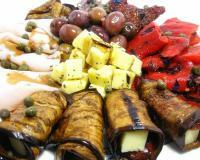 Roast vegetables 20 minutes in the preheated oven, tossing occasionally, until roasted**. 5. While vegetables are roasting, in a large pot of salted boiling water, cook pasta 8 to 10 minutes, until al dente, and drain. 6. Make the salad dressing by mixing all the dressing ingredients. 7. In a large bowl, toss together cooked pasta, chicken, vegetables and the salad dressing***. 8. Pour in the desired dish, sprinkle with feta and decorate with parsley leaves. Serve immediately. * You can use olive oil instead of light mayonnaise for a healthier option. ** It is a good idea to use a separate cookie sheet for yams as it might take them longer to roast than other vegetables. *** Pasta absorbs the salad dressing so if you are making this dish ahead, use only half of the dressing and add the remaining half just before serving. I had the opportunity to taste the real thing that Sara herself had cooked in a party. It was so good and delicious. 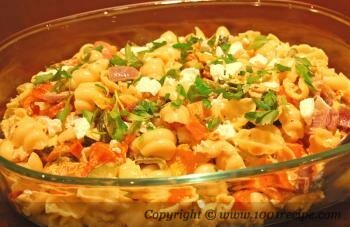 I specially enjoyed the sweet taste of roasted yam which was a nice complement to the pasta salad. Thanks Sara for sharing the recipe.